Brazil legend Pele is resting at home according to his spokesperson, who dismissed reports he had been taken to hospital with exhaustion, BBC reports. The 77-year-old was due to travel to London this weekend for a dinner held in his honour by the Football Writers Association (FWA). 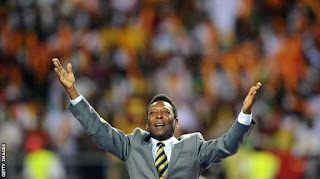 Pele - the only player to win three World Cups - withdrew and the FWA said he was being monitored by doctors. But his spokesperson called reports of his hospitalisation "fake news". "He just didn't want to make a long and stressful trip to London, in and out of who knows how many planes and airports," said Jose Fornos Rodrigues. "That's all." He helped his country win the 1958, 1962 and 1970 World Cups and was named Fifa's Player of the Century.